Now the bad side is that due to firmware update, I can't use the map application and have to wait till I get the activation code from the site. I have been waiting for more than 6 days, called customer support and was told to wait till the site is fixed. So the GPS is now like a brick with limited functionality. I wanted to use the old map version till the site is fixed, I was told that I have to send the device in to fix it. I guess you can sell a car without an engine and expect the customer to wait till the company figures out where the engine went. Guess the web site still has a problem. 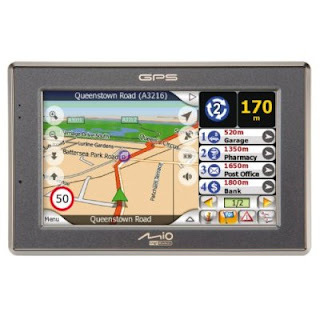 I love my Mio c520 but I need a map update. Also, what is their support phone#? I suggest that you visit some Mio forums for any problems. I own both the Nuvi 660 and the 760, I'm writing this review for people having trouble deciding between the two as the price difference between the two products at the time of this review is about 100 dollars. I'm not going to focus on the feature differences, as that information can be easily obtained from specifications and online reviews. The 660 was a fine product back in 2005-2006, but the new 760 outdoes the 660 in practically everything, but there are some key usability fixes that make the 760 a better buy for the frequent user. 1. 760 has much better fonts for street names than the 660. This may seem like a trivial update to some, but the 760's fonts greatly improve visibility. The 660 uses all capitalized text for street names on the map, and the font is incredibly cartoonish and unaligned, something like the scribbling Comic Sans font on the PC. The 760 uses your standard Verdana-like font with street names in capitalized and lowercase letters. The fonts on the 760 are smaller, cleaner and surprisingly much easier to read while driving. The maps end up looking professional, and not some cartoony children's video game. 2. 760 has better rendering in 3D map mode than the 660. In the 660 when you are zoomed in under 3D map mode, the roads close to your car are displayed incredibly large, so large that they run into other roads, making the zoom function essentially kind of useless for dense roads. The 760 does not oversize your roads just because you zoomed in to view smaller roads in detail. This fix is very nice for those who drive in places with dense roadways, like New York City. 3. No antenna on the 760 makes hooking up your Nuvi to the cradle one step easier. On the 660 you need to flip up the antenna before attaching the cradle. For people who park their cars on the street overnight, removing the GPS from the cradle for storage in the console or glove compartment is a must, and it's a lot easier hooking up the 760 to the cradle than the 660. It's hard to aim the 660 to its cradle in the dark as you have to align both the bottom edge and the charge port under the antenna. In the 760, the charge port is directly on the bottom of the unit; you can attach it to the cradle with one hand in the dark easily on the 760. 4. It takes the 660 a good 45 seconds on average (sometimes longer than 2 minutes) after boot up to locate the satellite on a cold start. If you have firmware 2.6 installed on the 760, the satellite acquisition time after boot up is between 10-20 seconds. After the firmware update, my 760 also holds a stronger lock to the satellites than my 660, I can get satellite lock inside my house with the 760, whereas I can't get a lock with my 660 (adjusting the antenna does very little). 5. The ability to set multiple ad hoc viapoints on the 760 means it's a lot easier creating alternate routes (very handy to avoid a specific interstate or a high traffic road). Whereas the 660 gives you just one viapoint.